Your ticket/s will be sent by courier after successful payment. (an hour before the event) Price: 1,50€. It is also possible to make a pick up at the Eventim Si points of sale( they are listed here) and Big Bang points of sale up to 3 days prior to the event. The customer must bring the e-mail with the pick up code. The eventim.si mobile ticket is a new delivery method that will be available for certain events. The buyer can chose this method during the purchase procedure by selecting the mobile ticket option and then filling in the required personal information including his mobile phone number. Upon a successful purchase the customer, will receive an SMS with a link to his mobile ticket. To view the mobile ticket the customer must have an active data transfer option on his mobile phone. 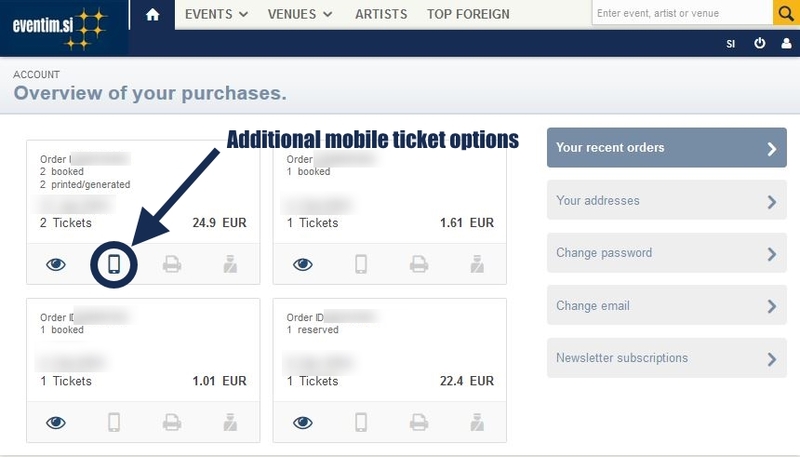 The customer can review his mobile ticket in the Recent purchases tab on the www.eventim.si web site. The customer can also resend the SMS containing the link to his current mobile phone or a different mobile phone. At the event, the mobile ticket will be scanned the same way as a normal ticket at the access point. The mobile ticket does not need to be exchanged for a printed ticket. If a single mobile ticket order contains several tickets all the customers must enter the venue at the same time. 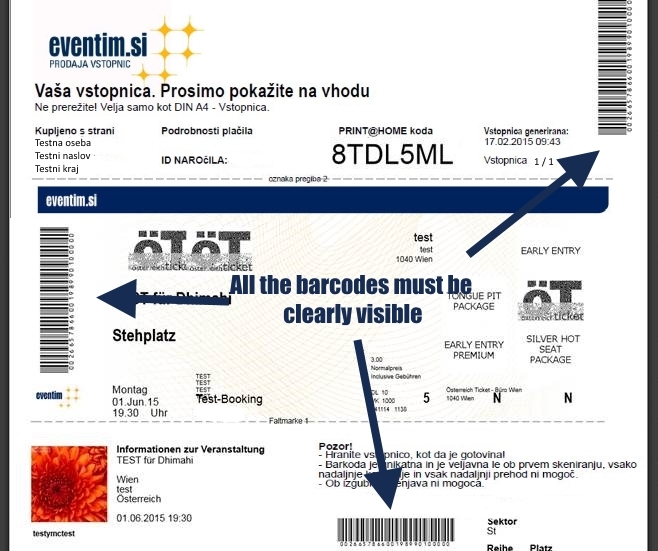 -the mobile ticket barcode is unique and is valid only on the first scan. Any additional check will be invalid and any additional area transitions are impossible. -protect your mobile ticket from unauthorised access. Eventim.si cannot be held accountable for any problems resulting from, forwarding the ticket, forwarding private information or copying. The organiser holds the right to deny access to a person under the suspicion of mobile ticket abuse with an identical barcode. Mobile tickets can be sent only on slovenian telephone numbers. Want to visit an event but your tickets would take too long to arrive by conventional mail? There is no reason to stay at home. Simply print your tickets right before your chosen event - use your printer and avoid shipping costs! Print@Home allows you to search for, order, pay for and print original tickets with the use of internet and your home printer. How does the Print@Home work? Print@Home tickets are available on the Internet platform www.eventim.si, you just need to select Print@Home as your delivery method. You have selected your ticket and your delivery method Print@Home. For payment of Print@Home tickets you can use any online payment methods i.e. VISA, Mastercard credit cards, as well as the Moneta payment. Upon successful completion of the online reservation and the payment, you will see a button Print@Home appear in your shopping history, which will allow you to access and print your PDF ticket. In ''My Account'' (''my account'') you can access and print the ticket at any time, including immediately prior to the event. (IMPORTANT NOTICE: ticket will be electronically registered on entry and is valid only once! It is therefore important that you have your Print@Home ticket with you and do not share your electronic link with another person. In the case of copies or multiple prints only the person who uses the ticket first will gain the access to the venue. - It is required that you have "Acrobat Reader" version 5.0 or higher installed. If the reader version is not up to date the barcodes will not print correctly! - The printing quality must not be set to'' draft'' ("draft"). - Tickets printed by inkjet printers are sensitive to moisture (smudging bar codes), so ticket must be protected from moisture. - Printing can be done in color or black and white. How safe is a Print@Home ticket? As safe as a normal ticket. 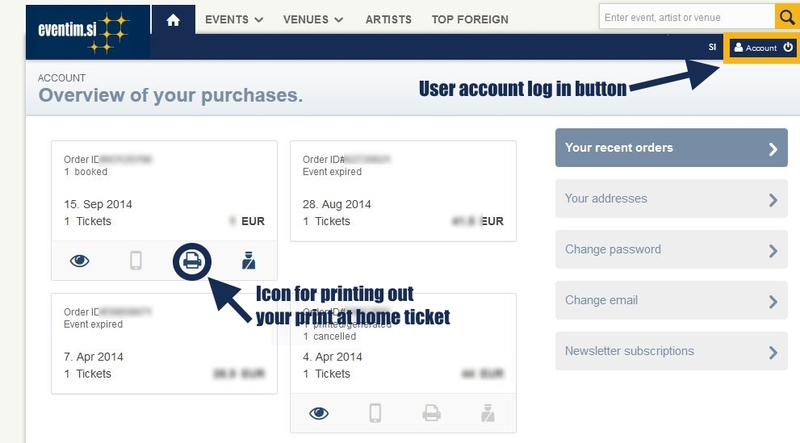 Each Print@Home ticket is read by the control system when entering a venue. With this ticket a single person can enter a venue only once. It is therefore important, for the ticket to be kept safe, inaccessible to others. The same applies to your online connection. In the case of copies or multiple prints, only the first person to go through the entry control will be able to enter. In the case of copies or multiple prints the customer can be held responsible by the organizer. What should I do if the ticket is stolen, lost, or could not be printed? If the ticket is not generated (this can happen in the event of a short circuit in the connection with the server), please contact us on: info@eventim.si. Have your reference number and email address ready and we will send you your ticket via email. What does the entry check look like? At each event there is at least one entry control point for each of the entrances to which print@home tickets were sold for. Tickets are checked by handheld readers or the entry control system, installed at the site. The organizers and venues receive hardware and software to control the entry from Eventim. Print@Home tickets are available only at Eventim for the events where the electronic entry control has been installed. When does the electronic entry control not accept a Print@Home ticket? -A ticket that was not paid for or canceled after it has been issued will be recognized by the system as invalid and denied access. The organizer reserves the right to take appropriate legal action against offenders that access the venue without proper authorization or abuse the tickets in any way. - Bar code has already been identified and the access denied by the electronic entry control, because someone already entered with a copy of the print@home ticket. - Bar code cannot be read. How long before the event are Print@Home tickets available? How much does a Print@Home ticket cost? Ticket itself costs as much as a normal ticket. There are no shipping costs. The cost for issuing a Print@Home ticket is 0.90 euros and paid by the client. The organizer pays part of the costs of entry control, but has the advantage of added safety and a longer term for online sales. What are the advantages Print@Home ticket? - It is no longer required to call a call center or visit the sales office to make your purchase. - The possibility of booking a ticket until the last minute before an event. What error messages may appear when ordering? 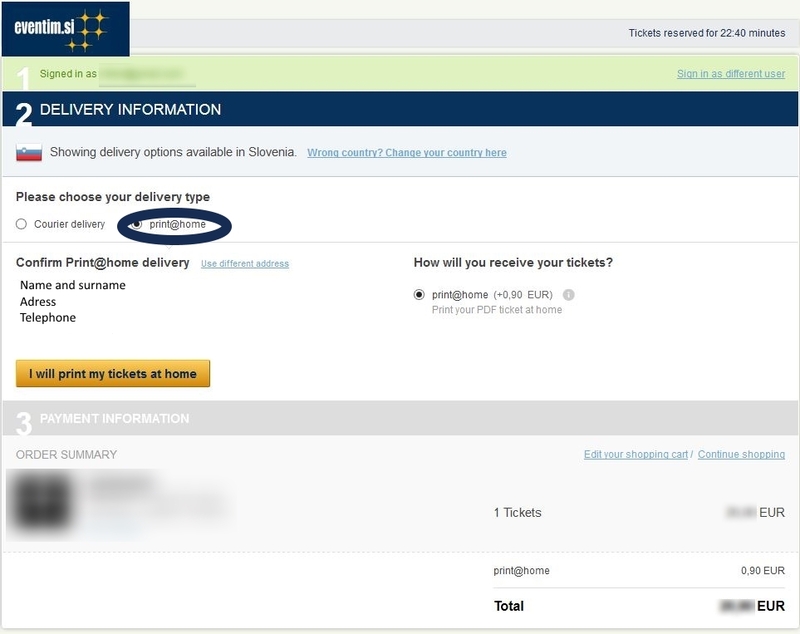 - Delivery Method "Print@Home" is not showing up: tickets cannot (currently) be printed for this event. Please select a different shipping method. - The reservation was not carried out: Your payment could not be made. If possible, please use another payment method. This error can occur if your payment partner does not accept your payment (credit card company, mobile provider, bank) or when payment channels of your payment partners or connections to them are not available (such downtime usually lasts for a few minutes up to a few hours). Please select a different payment method or try again later. - Ticket can’t be printed: Acrobat Reader is not installed, maybe it's an older version than 5.0, or you do not have access to the program. Download the new version here or contact your system administrator. - E-mail confirmation cannot be sent: You have entered an incorrect e-mail address.